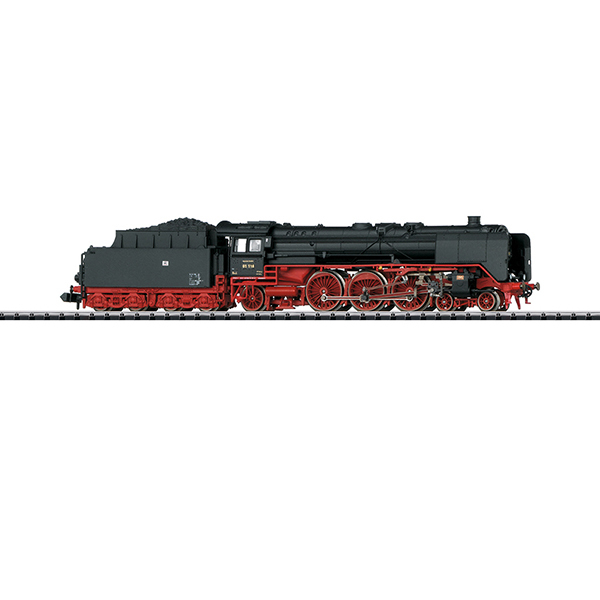 Model: The locomotive and tender frame as well as the tender body are constructed of die-cast metal. The locomotive has a built-in digital decoder and a sound generator with the formats DCC and Selectrix. The motor and gear drive are in the tender, and the motor has a flywheel. 3 axles powered. 4 traction tires. The tender is. Firebox flickering is done by means of processor-controlled LEDs (red-orange). Warm white LEDs are used for the triple headlights, cab lighting, and running gear lights. The smoke box door can be opened. There is an NEM coupler pocket on the back of the tender. Length over the buffers 150 mm / 5-7/8". Steam Locomotive 01 118 The class 01 was the epitome of German express steam locomotives for many years and almost to the end of steam motive power in both German states. Neither lay people nor experts could escape being fascinated with it and the way it conveyed power, elegance, and speed. The first type plans of the German State Railroad Company (DRG) established in 1920 included the classes 01 and 02, one each of a two-cylinder and a four-cylinder compound express locomotive that were identical in all other parts. After the conclusion of comparison tests with ten each pre-production locomotives of both classes, the dice fell in favor of the two-cylinder unit and regular production of them began with road number 01 012 starting in 1927. Procurement of them did not end until 1938. This was a time span of more than twelve years, which almost inevitably resulted in design changes. A total overhaul of the design preceded the units of the third series (01 102-190): While road numbers 01 102-149 still had a copper firebox, the steel firebox was introduced starting with road number 01 150. The firebox and the boiler shell now had a larger number of cleaning holes and the piston feed pump was replaced. The frame design was reinforced and the running gear, the springing as well as the brake rigging was extensively improved. The permissible speed could thus be increased from 120 to 130 km/h / 75 to 81.25 mph. The design changes to the last production run (01 191-232) by contrast included essentially only replacing the standard piston valves with pressure balance valves of a design by Karl Schulz. After World War II, 65 operational units remained in the Soviet Zone on the later DR of the GDR. A thorough overhaul and redesign into the new class 01.5 was done there to 35 units between 1962 and 1965. There was also still enough to do for the remaining older design class 01 units. The maintenance facilities at Berlin-East Station and Dresden developed specially into strongholds for them starting in 1967, where they could show what they still had over the next ten years pulling heavy international express trains on the line Berlin – Dresden. Here road number 01 118 might have proven itself, starting in mid- 1970 with the computer-generated road number 01 2118-6. The end of the summer schedule for 1977 on September 24 also saw the conversion to diesel locomotives of express trains pulled by the class 01 between Berlin and Dresden. Along with most of its colleagues there was now only heating service for road number 01 2118. Yet in March of 1980, there was one last furious comeback: The drastically increased price for petroleum oil imported from the USSR forced the DR to conserve heating oil and diesel fuel. Road number 01 2118 along with other coal-fired colleagues was transported to the maintenance facility at Saalfeld, where they now had to pull mainly limited stop and passenger trains via Gera to Leipzig until the end of February 1981. In the same year, the association "Historic Railroad of Frankfurt" was able to acquire the locomotive and it was used there in museum operations. Special runs also took it to France, Luxembourg, the Netherlands, and Switzerland. With overhauls done at regular intervals and the installation of the PZB 90 train safety system in the spring of 2004 it is the only locomotive of its class that has been kept operational continuously since being placed into service in 1934.